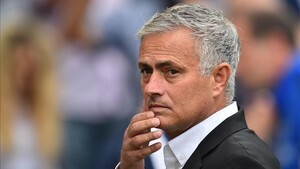 Jose Mourinho has released a statement in the aftermath of his Manchester United departure, praising the people around the club while asking the media to give him space until his return to football. Mourinho was dismissed by the club on Tuesday, ending his Red Devils tenure halfway through his third year in charge. The Portuguese manager was stopped by reporters earlier on Wednesday, saying that he and the club will survive without the other after his dismissal. He has been replaced by Ole Gunnar Solskjaer, who will take charge of the team on an interim basis until the end of the season. "I have been immensely proud to wear the badge of Manchester United since the first day I arrived, and I believe all United supporters recognise this," Mourinho said in his statement. "I know that you are all aware of my professional principles. Each time a chapter is closed I show my deepest respect and I don't make any comments about my former colleagues.